The star fruit or carambola (Averrhoa carambola*) is a unique tropical fruit. This fruit acquired its name from the five pointed star shape * when cut across the middle of the fruit (occasionally 4 or 6 ribbed fruit may occur). The 3 to 5 inch long fruit has a paper-thin thin, translucent, waxy, yellow-orange to green skin with tart crisp flesh. Star fruit range in taste from pleasantly tart and sour to slightly sweet with a complicated flavor combination that includes plums, pineapples, and lemons. The fruit is juicy and crunchy, and may be eaten skin, seeds and all or used as a garnish, in salads and in relishes and preserves. When used in cooking, green fruit are frequently used for their sourness. The juicy flesh is mostly water and does not hold up well when heated. * Carambola: Named after Averrhoës [Ibn Rushd], a 12th century Muslim philosopher and physician. Carambola is a Portuguese word derived from a South Indian language). Although it is not now found in the wild, the star fruit is originally native to Sri Lanka and the Moluccas, and has been cultivated in Southeast Asia and Malaysia for almost 1,000 years. The fruit also goes by many other names including: belimbing or belimbing manis(Indonesia), mafueng (Thailand), kamrakh(Indian) Chinese star fruit, star apple and Five angled fruit. Today they are also grown throughout the Caribbean, Central and South America, Florida and Hawaii because the fruit thrives on growing in a warm environment. A member of the Oxalis (wood sorrel) family, star fruit grow on a bushy tree 25 to 30 feet high with a spread of 20 to 25 feet. The leaves are sensitive to touch and light, folding up at night or when touched. The fragrant flowers are pink to lavender in color, about 3/8 inch in diameter. The fruits grow in groups of 3 or 4 on the branches and trunk of the tree and the trees produce fruit for up to 40 years. Star fruit are non-seasonal and produce 3 to 5 crops each year. Two varieties are found in markets, one sour and the other slightly sweet. Their flavor is sometimes described as like a cross between an apple and a grape. It is almost impossible to tell the sweet and tart varieties apart, but in general the tart varieties have narrowly spaced ribs and sweet varieties have thicker, fleshier ribs; some also report that the yellower, the sweeter. The tastes between the two are hardly distinguishable, as the tart variety still has some sweetness. There are several white varieties, all of which are sweet. This tropical fruit is readily available July through February. Preparations of the leaves and roots have been used to cure headaches, hangovers, sore eyes, ringworm, prickly heat and chickenpox. Given to nursing mothers it is believed to stimulate the flow of milk. Select firm, shiny skinned, even colored fruit. Star fruits will ripen at room temperature and have lightly brown edges on the ribs and a full fruity aroma when ripe. Avoid purchasing fruit with brown, shriveled ribs. This delicious fruit is also available dried. Star fruit bruise easily, so handle with care. Non-ripe fruit should be turned often, until they are yellow in color and ripe with light brown ribs. Store ripe star fruits at room temperature for two to three days or unwashed, and refrigerated, in a plastic bag for up to one to two weeks. 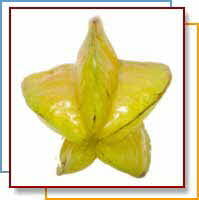 Star fruits are great to eat out of hand as these tropical delights do not need to be peeled or seeded before eating. Simply wash the fruit, remove any blemished areas, cut crosswise to get the star shape, and eat. Warning: This danger appears to be limited to individuals with very specific medical conditions. Star fruit originated in Southeast Asia and is readily available in Taiwan. Star fruit causes several symptoms in patients with chronic renal failure or end-stage renal disease. The symptoms vary and include insomnia, intractable hiccups, agitation, muscle weakness, confusion, consciousness disturbances of various degrees, seizures, and cardiorespiratory arrest. The various star fruit subspecies contain different toxins, including a powerful neurotoxin that is suspected to accumulate in blood, cross the blood-brain barrier in chronic renal failure patients, and eventually cause irreversible damage. Star fruit intoxication is a neglected but serious fruit intoxication frequently observed in patients with chronic renal failure. Because no effective treatment is currently available, patients— especially those who are newly diagnosed with chronic renal failure or end-stage renal disease—must be warned not to ingest star fruit, even in small amounts. Posted on August 27, 2011, in Carib Oasis and tagged Averrhoa carambola, Benefits, Carambola, Fruits, Star Fruit. Bookmark the permalink. Leave a comment.